A Syrian woman takes a coach bus heading to Syria in Beirut, Lebanon, Feb. 28, 2019. 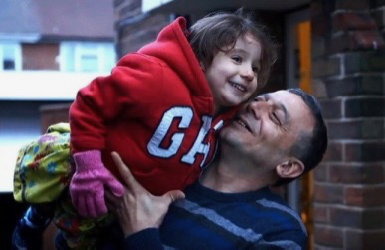 While some Syrian refugees are being resettled in other countries like Britain, others are starting to return home. Dozens of Catholic parishes throughout the country have become involved in helping vulnerable refugees from war-torn Syria find sanctuary and rebuild their lives in the UK. Of more than 160 groups in the UK that are involved in the government's Community Sponsorship Scheme, about a third, or 50, are Catholic parishes in England and Wales. And about a third of these parishes have already welcomed families. Sean Ryan, Caritas national coordinator for the scheme, told The Tablet: "The number of families is exponentially moving forward. More or less every week, now, we get a new family coming through. It is taking off because word is getting out. People are seeing the flourishing of communities through national networks and people talk to each other." A leaflet went out to every parish earlier this year, but word of mouth has been equally if not more effective. Parish involvement requires a large team from a parish to work closely together over two years minimum. "People who have only ever seen each other in the pews are becoming friends. It is galvanising parishes," said Mr Ryan. Each parish has to find a sponsoring charity to help train people, in effect ordinary parishioners, who are being sent out to the front line of directly helping some of the world's most vulnerable people. This is coordinated through CSAN's network of charities in the dioceses. This young man, pictured here with his daughter, is a talented chef. Resettled in Britain through community sponsorship by a Catholic parish, he has recently opened his own Middle Eastern restaurant in Stretford, Manchester, just over two years after arriving in the country following a harrowing four-and-a-half-year year ordeal for him and his family, as Syrian refugees in Lebanon. The first Catholic diocese to get involved was Salford, where Mr Ryan is based, and which now has 11 parishes engaged with the scheme. "People know each other and talk to each other and hear about the completely transformative impact that being involved is having on the communities. The most common feedback we are getting is people saying that quite simply, this is the best thing they have ever done in their life. Having that opportunity and realising the enormity of what we are doing, which is to save lives and transform the lives of entire families. He spoke as the Shrewsbury diocese revealed that its first parish, Our Lady and St Christopher in Romiley, near Stockport, had welcomed a family from Syria. It came about partly because of a fundraising initiative in the Shrewsbury diocese, Our Mission Together. Parishioners were so generous in raising money that the target was exceeded. Other parishes in Shrewsbury now wish to become involved also. The Stockport parish, like many others, was responding actively to the call by Pope Francis for parishes to help out in the migrant crisis. Canon Michael Gannon, the parish priest, said: "I thought we should try to resettle a family from the war in Syria in the parish." Also the parish was aware that the Bishops' Conference supports the Community Sponsorship Scheme and that David Cameron, when prime minister, had pledged that the UK would take up to 20,000 people from the war in Syria. Canon Gannon explained that Caritas in the Shrewsbury diocese was the sponsoring body. About 17 people in the parish became involved in preparing for and welcoming the family of five, including three children. A private three-bedroom house was rented, and within two weeks was kitted out by volunteers. The refugee family are paying the rent from benefits, but the aim is for the adults to have learned English and become self-supporting through work in about two years – the length of time the parish is committed to helping them. The help is certain to go on longer if needed, however. He described how team from the parish met the family at Manchester Airport after they flew from Beiruit via Istanbul. They had been living in a refugee camp in Lebanon since 2012 when they fled the war in Syria, having lost everything. The three children are now settled in school. "It is just nice to be able to make a difference to their lives," said Canon Gannon. The Vulnerable Persons Resettlement Scheme was set up in 2014. During 2018 there were 4,407 Syrian refugees allowed into the UK under this scheme. In September 2015 the Prime Minister announced an expansion of the scheme that aims to bring an additional 20,000 Syrians from the region. Refugees can be resettled through being allocated to local authorities or to community sponsorship schemes. They are also chosen through the Vulnerable Children Resettlement Scheme, which involves mainly Syrian but also some families from other countries.